A wallet case with your own photos and designs decorating the front and back of it. 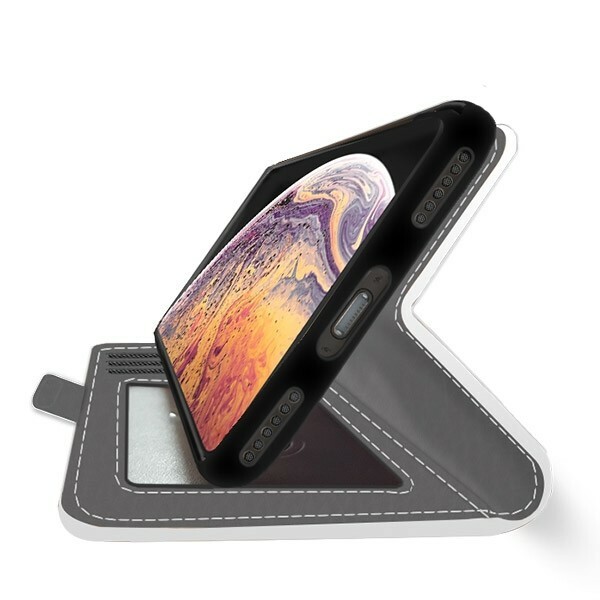 Create a custom iPhone Xs Max case for a stylish look and storage for your daily essentials. An amazing look and great phone protection; designed by you and made by us. 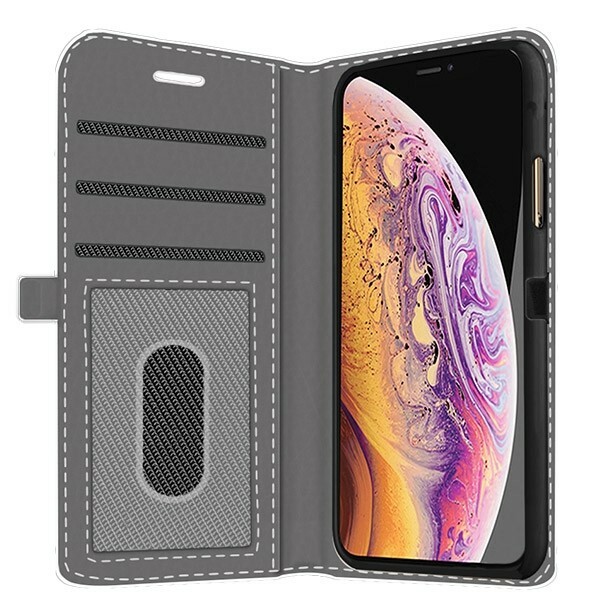 iPhone Xs Max wallet custom cases are the perfect case type for someone that likes a professional look with an organizational flair. Not only is it possible to fully print your chosen photo or design on the outside of the case, but the inside also offers space to hold important cards and cash. Aside from those obvious benefits, a wallet case offers great protection because it wraps around your phone. 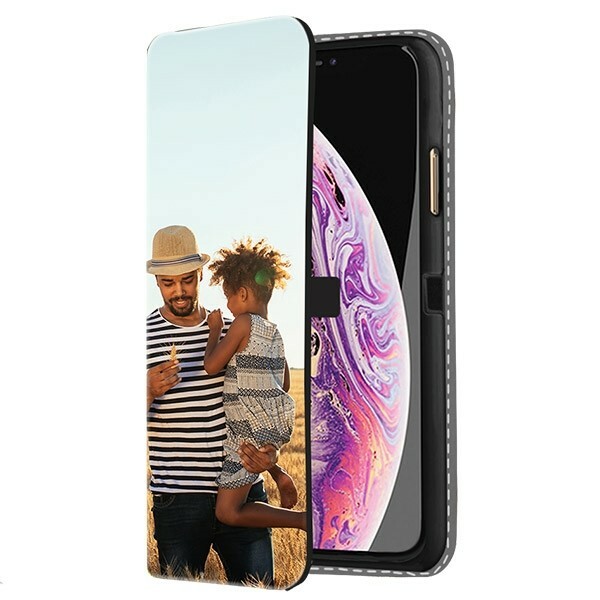 This shock adoption and screen coverage mean that your screen is less likely to take scratches in a bag and able to cope with drops better than slimmer cases. Get the best in protection and organization, printed with a design you are sure to love. Designing your custom iPhone Xs Max case can be as easy as printing a photo of your children or and can be more complex like creating a collage of multiple photos. There are a lot of possibilities available to you when you design your own phone case. We’ve also made it very quick and easy to create a beautiful case. Upload your photos or designs from your laptop, phone, or social media account. Add multiple photos to create a collage or simply make some small adjustments to one image. Add some final touches with text, filter, or emojis, and you’re done. It’s so easy, give creating your own custom case a try. Now that you have done the creative part, it’s our turn to turn your idea into reality. Before you click the ‘Check Out’ button though, double check to make sure you are happy with the design and that your shipping information is correct. Almost immediately after your order has been submitted our production team will start working on it. 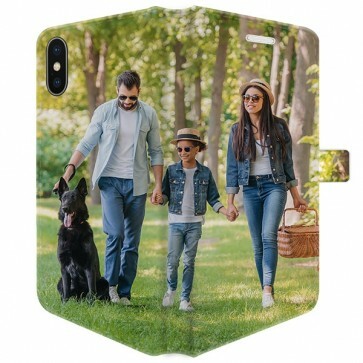 Your custom iPhone Xs Max case will be printed with high-resolution printers using scratch-resistant ink so your personalized phone case will look great and last long. Our team will give it a check to make sure there are no mistakes before shipping it to you. In very little time, you can create a unique custom phone case. Try it.